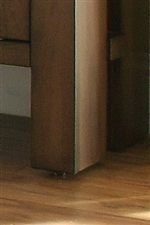 Use this return desk as a standalone piece or place it to the right or left of the corresponding double pedestal desk (98832) for a comprehensive L desk configuration. The piece is constructed of walnut veneer in a casual walnut finish that pairs beautifully with the metal legs and framework. 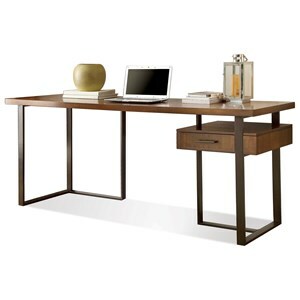 The Terra Vista 1 Drawer Return Desk by Riverside Furniture at Stuckey Furniture in the Mt. Pleasant and Stuckey, South Carolina area. Product availability may vary. Contact us for the most current availability on this product. 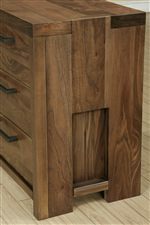 The Terra Vista collection is a great option if you are looking for Contemporary furniture in the Mt. Pleasant and Stuckey, South Carolina area. Browse other items in the Terra Vista collection from Stuckey Furniture in the Mt. Pleasant and Stuckey, South Carolina area.